Is this the time of year in which you tend to think about love and romance and make effort to be more loving towards yourself and others? YES! Valentine’s is coming! 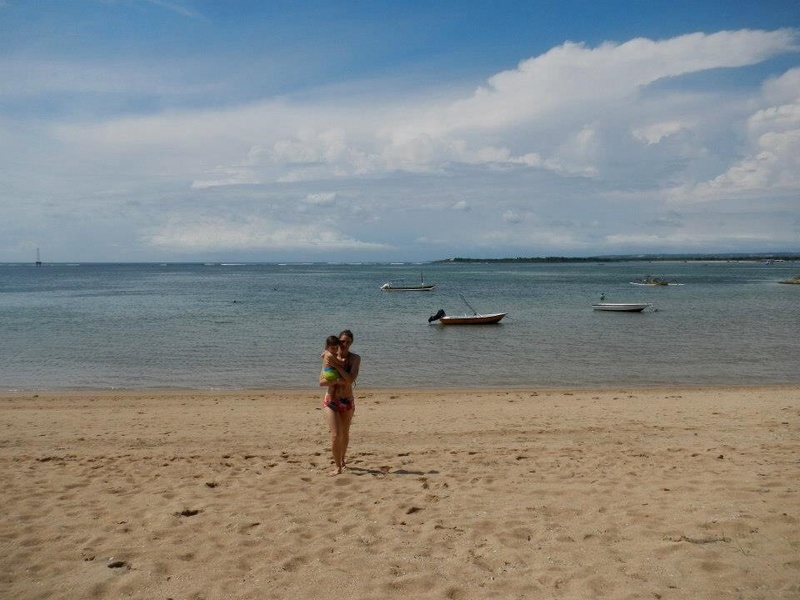 As you are reading this, I am enjoying most beautiful island of Bali with my husband and son. It is easier to feel loving and lovable when in the mood for holiday and surrounded by the beauty of nature. What about everyday life? Sometimes I feel angry or powerless as things get out of control, or I might feel burdened by many responsibilities, or usual routine makes my life feel dull… Under these circumstances can I still feel IN LOVE with myself, my husband, my son, life itself? I say YES! and practicing yoga is my answer. Right, yoga is my answer for most of my questions (as it really does work!). When yoga is approached as a practice to deepen awareness, it helps to cultivate the skill for self-compassion and love which is especially useful when your life has become out of alignment. And the practice could be very simple – just feeling your body. Do you know that your body speaks your mind? Your body is a barometer of what’s really happening in your mind and in your life. Breathe deeply and notice how your body feels today. Where do you feel tightness? Any discomfort anywhere? Just bringing awareness to some place in your body stimulates the flow of vital energy to this place. It might intensify your sensations at first but if you keep your calm focus and deep breath, the physical discomfort will gradually disappear and it will release some mental pressure too! This is a practice I’ve been doing more than any other ones since my son was born. The reason is simple – it’s very effective in relaxing the body and mind and I can do it pretty much any time, even while simultaneously taking care of my baby. In this case I choose a smaller area to concentrate on – say, my feet if I’m walking, or my hands if I’m cutting veggies. Since we talk about it before the Valentine’s day, I suggest you concentrate on feeling your chest and your heart area. Is your heart cold or warm? Open or closed? Soft or hard? Really feel into it. And stay with whatever comes up for you for some time. Keep choosing feeling instead of thinking. Don’t let your mind interfere. Then start exhaling anything that doesn’t serve you anymore. Empty it all out. Create some renewed space in your heart. As the next step, allow your breath get deeper and start inhaling love. Feel warm smooth soft sensations filling in your heart. And feel the well of love which is always in your heart pouring out. You ARE love. That’s what your deeper self is. Just pure love. Once you feel you’ve had enough, finish the practice with sending love, blessings and warm wishes of happiness to your loved ones and all beings. Repeat daily or as often as possible. I hope you will try this meditation for yourself, and will like it as much as I do. It’s important to learn to nourish our deeper self first, to feel love, to be love. Only then we can share it with others. It is also great to stay open to the love that surrounds us. You might be surprised at how much you are given when your heart and mind stays open. Giving and receiving freely is so much fun! As you learn connecting to your heart and your true real self – LOVE, you will find it much easier to stay connected and loving to others. This entry was posted in Conscious motherhood, Lifestyle, Yoga and tagged breathing, contentment, family responsibilitiy, meditation, nurturing, self-growth, true love, Valentine's day, yoga by Zoya Lu. Bookmark the permalink. If you don’t love yourself, you won’t be truly capable of loving anyone else. We Christians say we are made in the image of God- which means we are loving, creative and powerful. Thank you for the follow. Please comment, the dialogue makes the hobby worthwhile. Yes, we all have divine nature. We are love and light.